“Mako is often found in cafes about town, drawing what she sees in Launceston’s cafe scene, and now you can see a selection of her pictures at the café Milkbar. These delicate pen drawings have been chosen from a mountain of Mako’s sketchbooks. She has walked around Launceston with her sketchbook, finding comfortable and beautiful places, having coffee at cafés and drawing people while they relax and enjoy their time. In the great amount of time that she has spent in cafés since she came to Launceston in 2009, she has developed a great love of the café culture here. Guess how many cups of coffee she has had in these 3 and a half years? 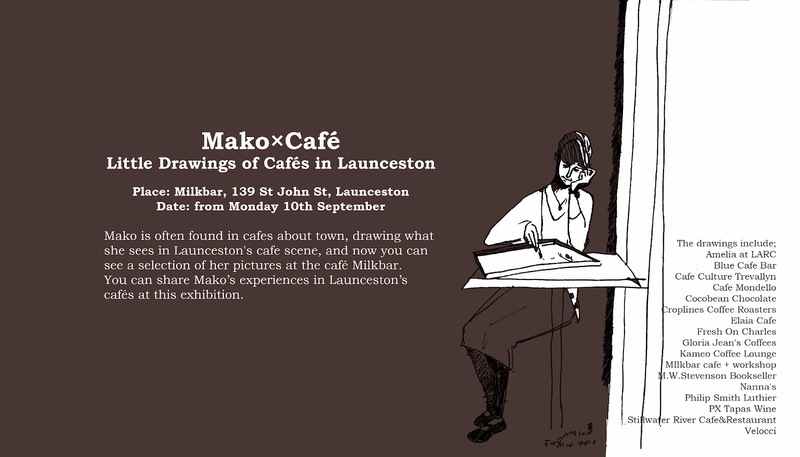 You can share Mako’s experiences in Launceston’s cafés at this exhibition.